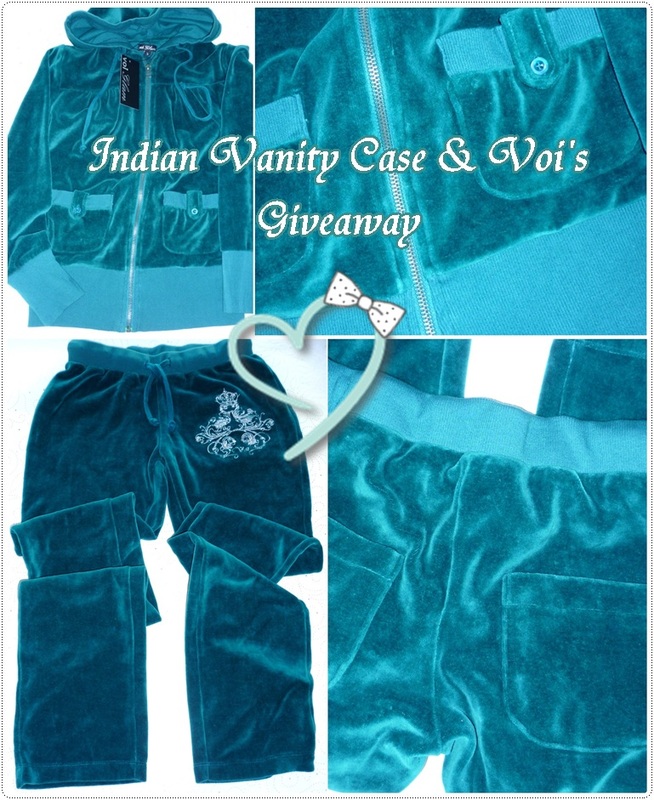 In my previous post where I showed you some chic sets of Velour pants & hoodies, I said that there would be a giveaway. So here's a brand new set in a lovely dark teal color (my camera doesn't pick up green well) for one lucky reader of IVC! Sizes available: Small (my size), Medium, Large, Extra Large. If you do all, your name will appear 8 times in the list. * We will be checking everything, so anybody who cheats will be disqualified. This giveaway is open internationally. All entries must be submitted before 7th February, 2011 at 11:00 PM IST. Winner will be randomly picked by me and will be announced a couple of days after that. The winner will be contacted via email and if I don't hear from her within 48 hours, another winner will be chosen. *Note: The sets are brand new & will be mailed by the company in the best condition. However, they will not be liable for any loss or damage in transit. And I wear XS size...plzzzz give me... i loved it..keep posting lovely stuff!! but congrats in advance to the winner- they are a luck duck! i tweeted about it ! I think you know me pretty well on the blogosphere, so I'll be lazy and skip a few steps. I have done everything except the sidebar thing, but I'll do that soon, promise! Google Friend Connect Name: Rory D.
liked on facebook, i'm manju on there.